The fate of a realm is in the hands of a savage and a scoundrel…>>>Once a respected wizard Finster is now a drunkard and a con man living anonymously amongst simple, easily manipulated village folk. But his self-serving cunning cannot save him when soldiers of the Magus Supremeus of the High Order burst in to drag the disreputable mage to the dreaded Red Citadel.>>>Finster’s captor, the new Magus, is none other than Ingrid the InsaneHis former acolyte, a young woman of cold heart and ruthless ambition who has already murdered numerous magic-doers in her quest for ultimate power. The only reason Finster still lives is Ingrid’s belief that he knows the whereabouts of the Founders Stone, a magical artifact that could make her invincible.>>>Rendered powerless by a scarab beetle attached to his backFinster realizes he is doomed unless he escapes and recovers the Stone before Ingrid does, and he turns to his dungeon cellmate for help. But the hulking, mute, barbarian youth he calls “Moth” is inscrutable and unpredictable. 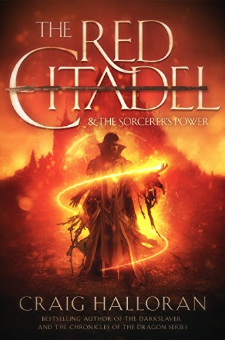 And their ultimate survival—and the survival of an entire kingdom—may require the cowardly wizard to assume a most unfamiliar and uncomfortable role: hero!Scroll Up And Grab Your Copy Today!More...Halloran makes a powerful stand with his thrilling fantasy adventure, The Red Citadel. Chock full of battles, magic, evil, and intrigue—and peppered with some delightful Terry Pratchett Discworld-esque cynicism—Red Citadel is the story of the salvation of the disreputable fallen wizard, Finster. Taken prisoner by a murderous despot, the cowardly mage must join forces with a hulking, young, barbarian mute to uncover a magical artifact in order to save his own skin, and quite possibly a kingdom as well. This complete fantasy masterpiece is a full-length, 105,000 word, stand-alone novel that you can devour in a day or enjoy on a long trip!